2) Download and print the Registration Form PDF and mail it to us. 3) If you have not paid your deposit, you can go to the payment page below or contact us to send a check. $4,795 per person in SINGLE occupancy - EARLY BIRD (paid in full by check before October 22, 2019). SHARING A CABIN for 4 nights on the Nile Boat, but SINGLE rooms 10 nights in hotels. $4,995 per person in SINGLE occupancy - paid by Dec 22, 2019. 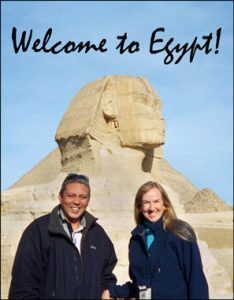 SHARING A CABIN for 4 nights on the Nile Boat, but SINGLE rooms 10 nights in hotels. Prices above are the total cost. Your $500/600 per person deposit will be counted towards these prices. I have paid the deposit online. I am mailing the deposit to you by post. Your payment of the deposit of $500/600 USD per person will reserve your place on the tour. My payment of the tour deposit constitutes a legally binding agreement to pay the balance for the tour by the date that it is due. If I need to cancel for any reason, I will do so in writing. I am aware of and agree to the refund policy as stated on the All One World website (see below). Note: This is your first name or nickname as you would like it to appear on your tour nametag. Note: We will need a copy of the photo page of your passport. This can be sent when you pay the tour balance. PLEASE CHECK THE EXPIRATION DATE on your passport. I must be 6 months (or more) after your departure from Egypt. Note: We will need a copy of the photo page of your passport. This can be sent when you pay the tour balance. I do not wish to share any. To help you stay in touch with your new friends, we will include in your tour booklet a list of the participants and their contact info. Please choose the options of the information you would like to have included about yourself. I have booked my flights. See info below. I have not booked my flights to/from Egypt yet. I have a roommate already or will be arranging for one. We can share a large bed. Please assist me in finding a roommate. I do not eat fish. I do not eat dairy products. I do not eat chicken or turkey. EMERGENCY CONTACT PERSON. If you don't know yet, you can send this later. I understand that my health is my own responsibility. I do not have any particular concerns that you need to be award of. I understand that my health is my own responsibility. However, I do have health restrictions which I would like you to be aware of. They are written below. ADDITIONAL HEALTH INFORMATION: Please let us know below about any health restrictions you have or any information we should know about regarding your health. I absolve All One World and Ruth Shilling of any responsibility for anything I may do that is illegal or endangering to myself or others. There are many drugs and substances that are illegal in Egypt. I will educate myself about these and act in accordance to the laws of Egypt while I am in that country. HOW DID YOU HEAR ABOUT OUR TOURS? THANK YOU! Any additional info you would like to tell us? Questions? Payment and Refunds Policy is below. Your payment of the $500 deposit constitutes an agreement to pay the remainder of the tour cost before the payment due date. The due date is 2 months before the tour begins in Cairo. For the Early Bird discount, the deadline for payment is 4 months before the tour begins in Cairo. The balance is to be paid by check for USA residents and by wire transfer to Cairo for those outside the USA.